New Mexico’s Jewish history reaches back almost 500 hundred years when some of the early Spanish arrivals by way of Mexico traced their family histories to Spanish and Portuguese Sephardic Jews who became conversos, or “converted” in order to escape the clutches of the Spanish Inquisition. Today, a number of Hispanic descendants are exploring their families’ crypto-Jewish roots. The mid-19th century marked the arrival of European Ashkenazi Jews via the Santa Fe Trail, and they became the leading merchants in the Territory. When the railroad arrived in the 1880s, more Jewish merchants arrived and expanded their business presence throughout New Mexico. The history of New Mexico Jews tells the stories of individuals and organizations who made their mark on all walks of life from business/commerce; ranchers and miners; social organizations; traders with the Navajo and Pueblo reservations; to becoming the first mayor of Albuquerque and first governor of the State. All of them made significant contributions to the Territory and later State, and it is our goal and responsibility to ensure the recognition as well as through educational programming this rich history reaches the public. New Mexico Jewish history, therefore, reflects a blend of both Ashkenazi and Sephardic cultural traditions, a unique feature in U.S. Jewish history. Established in 1985, the New Mexico Jewish Historical Society’s (NMJHS) mission is to tell and share the stories of the many Jewish groups that came and stayed and helped shape New Mexico the unique place that is it in the American Southwest. The Society sponsors ongoing research, presents lectures, holds conferences, shows films, maintains archives, sells publications about the history of pioneer Jewish families, and publishes an award winning quarterly newsletter, Legacy. 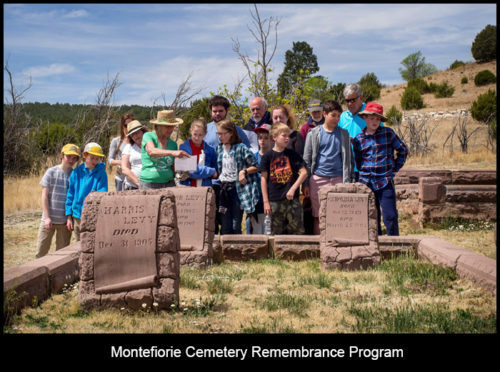 NMJHS sponsored a visit to the Las Vegas, NM Jewish Cemetery so that students from Temple Beth Shalom Religious School could learn more about Jewish settlers of New Mexico. Students took rubbings and recited the Mourner’s Kaddish with community members.